Guranteed Real Sterling Silver .925 Choose sz 16"-36"
Large designer clasp can be worn showing or not. Bright polish. .925 Sterling Silver Figaro Link Chain Necklace 1mm-17mm Sz 16"-36"
This is a beautiful solid 925 sterling silver crucifix cross necklace. The chain is 16.25" long and 2mm wide. 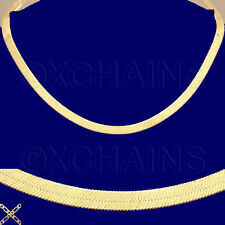 STAMPED 925 & ITALY - ALL SIZES 14" 16" 18" 20" 22" 24"
2 Thickness to Choose From - Real 14kt gold Box chains. WEIGHT 2 GRAMS.VERY ELEGANT DESIGN THAT'S WELL LOVED BY EVERYONE. QUALITY PIECE AT AMAZING SAVINGS. GET IT TO BELIEVE IT! 10K BLACK HILLS GOLD "Heart", Leaves, Necklace Pendant: 2.3 Grams. Condition is Pre-owned. Shipped with USPS First Class Package. 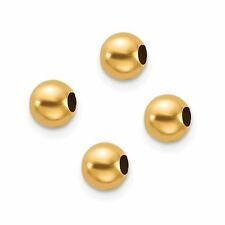 Authentic 10K Real Gold Two Tone World Globe Charm Pendant. World Globe Pendant. 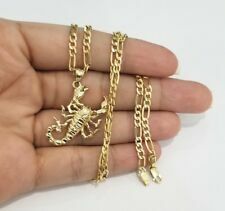 Pendant Size. Yellow Gold. Main Stone. Design & Developed by Maymaar Web solutions. CZ Diamonds. The chain was imported from Italy, only clasp has been made and assembled in USA. Chain has a 5mm spring ring clasp. Total item weight is a 1.25 grams and it has a mark 14K. 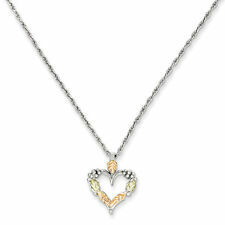 Our Sterling Silver Pendants are all high polished and made of the finest quality Sterling Silver. It is a solid Pendant and it is light weighted. • 18" Sterling Silver Cable Chain w/ 2 -1/2" Carnelian accented extension. • Sterling Silver. 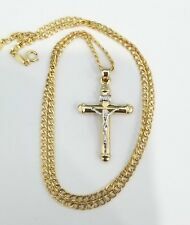 14k Solid Pendant Charm Santa Divino nino tri yellow white rose Gold 2.4g 1.24"
14K Yellow Gold Cross & 14K Necklace 10"
New 925 Real Sterling Silver 1mm Chain 16 Inch Necklace.